purplehomes: A question for all you creative people. 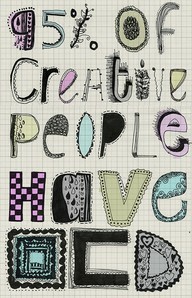 A question for all you creative people. How about all you creative people out there? Do you agree with the statement above? What OCD do you have? I am waiting for your response and already grinning :) I think I am really going to love all your comments...wink wink. Truth be told. I kind of agree with the statement:). I am obsessed about handmade things, about uniqueness, about being organized. Oh a neat/clean freak without a doubt! Maybe a trifle less OCD now than I was say 5 years ago, but still I definitely fall within the "OCD" meter!